For World Land Trust (WLT) and Ecuadorian partner Fundación EcoMinga, purchasing land is the main focus for protecting species and habitats. But simply acquiring the land is just the beginning as the reserves that are created must be managed and their wildlife protected effectively. A Near Threatened Black-and-Chestnut Eagle (Spizaetus isidori), photographed by an EcoMinga warden on patrol © EcoMinga. An integral part of this management and protection is the work carried out by the rangers who patrol the reserves to ensure that there is no hunting or encroachment of protected areas. The rangers are also responsible for maintaining the trails for staff and visitors, many of whom are visiting researchers, birdwatchers and biology students. This can be more difficult and time consuming than might immediately be obvious: sometimes there are land slides caused by heavy rains, and new rock falls and foliage growth can quickly make a trail impassable. Each ranger is equipped with a point-and-shoot camera which is an excellent way to record the birds and mammals that they encounter during their work. Wildlife captured on camera by rangers recently includes the Black and Chestnut Eagle, which is one of the species in most need of protection here. The rangers are becoming increasingly accomplished wildlife photographers and earlier this year Luis Recalde a park ranger for Fundación EcoMinga, had this image of a Caecilian attempting to eat a giant earthworm (a caecilian is a type of amphibian with no legs) published in BBC Wildlife Magazine. All the rangers are members of the local community and play an important role in acting as ambassadors for EcoMinga within these communities. In most cases the rangers previously owned farms which they sold to EcoMinga so that the land could be managed for conservation and as such they see the benefits of keeping their forests intact. As well as protecting the forests, the role they play in raising awareness of the conservation work being carried out is also essential. 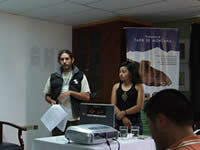 Over the last couple of months, Juan Pablo Reyes, Fundación EcoMinga Reserve Manager and Mountain Tapir field researcher, has been organising two conferences on tapirs, together with the Tapir Specialist Group UICN, Fundación Oscar Efrén Reyes, Finding Species, and Shanca Arajuno. 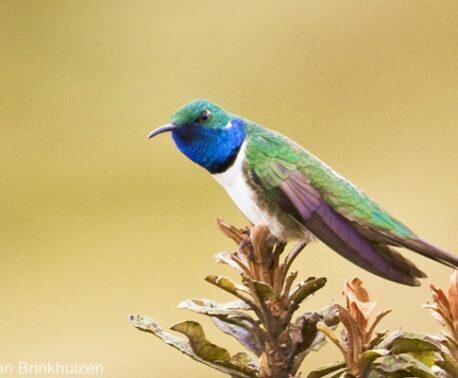 Part financed by the US Fish and Wildlife Service, these two conferences brought together researchers and wardens from all over South America, including wardens from EcoMinga and WLT’s other Ecuadorian partner, Fundación Jocotoco. The conferences were a great success and extremely beneficial for EcoMinga given that their reserves protect good populations of the endangered Mountain Tapir, as well as some individuals of the more widespread Brazilian Tapir. The reserve is a crucial stronghold for this charismatic species, which is highly regarded by the staff on the reserve. As Lou Jost of EcoMinga reports from the field: “Mountain Tapirs sometimes eat a few of our saplings. 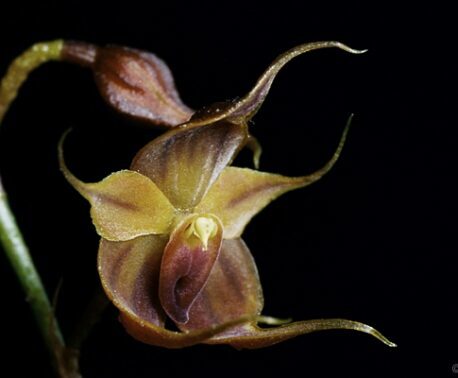 This is actually quite an honour!’’ Since 2007, WLT has assisted Fundación EcoMinga to purchase over 7,800 acres (3,250 ha) of threatened cloud forest and Paramo habitat, with particular focus on safeguarding areas of forest with large numbers of endemic orchids. 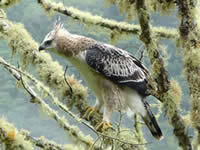 For more information on WLT’s work with EcoMinga visit our Cerro Candelaria Reserve page.